Bryan Scott Corey (born October 21, 1973 in Thousand Oaks, California) was a professional baseball right-handed relief pitcher who played in Major League Baseball, Nippon Professional Baseball, the Korea Baseball Organization and the Chinese Professional Baseball League during his career. Originally selected by the Detroit Tigers in the 12th round of the 1993 Major League Baseball draft, he was converted from a position player to a pitcher by the Tigers in 1995. Corey would make his Major League Baseball debut with the Arizona Diamondbacks after being selected 63rd in the expansion draft. After his short spell with the Diamondbacks in 1998, Corey became a Triple-A journeyman, playing for Triple-A affiliates of the Arizona Diamondbacks (1999), Detroit Tigers (1999), Oakland Athletics (2000), San Diego Padres (2001), Los Angeles Dodgers (2002–2003), Chicago Cubs (2004), Florida Marlins (2005), Texas Rangers (2006), and Boston Red Sox (2006-2008). In addition, he pitched in the Japan Central League with the Yomiuri Giants in 2004. On June 19, 2006, Corey had his contract purchased by the Texas Rangers to pitch in the bullpen, but was designated for assignment by the Rangers on July 25, 2006 after posting a 1-1 record with an ERA of 2.60. On July 30, 2006, Corey was traded to the Red Sox for minor league pitcher Luis Mendoza, but he was again designated for assignment after pitching 1 inning for the Red Sox, giving up a solo home run. He returned to the Red Sox for spring training in 2007 and went 0-1 with a 1.50 ERA in 12 innings, but was not selected to be part of the 25-man roster. However was called up on September 1 when rosters expanded. On April 17, 2008, Corey declined an outright assignment to Triple-A after being designated for assignment and became a free agent. 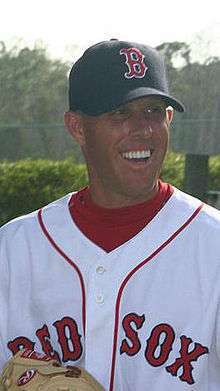 On April 22, 2008, Corey resigned with the Red Sox to a minor league contract. On April 25, 2008, the Red Sox purchased his contract from the Triple-A Pawtucket. He was once again designated for assignment on April 29. On May 11, 2008, Corey was traded to the San Diego Padres for a PTBNL or cash considerations. He became a free agent at the end of the season and signed a minor league contract with the Texas Rangers in February 2009. ↑ Shaughnessy, Dan (March 28, 2007). "Red Sox Notebook: Hansen, Delcarmen sent down". Boston Globe. Retrieved 2007-03-28. ↑ Petraglia, Mike. "Buchholz to make second career start". MLB.com. Retrieved 2007-09-01. Wikimedia Commons has media related to Bryan Corey.